I clearly remember how positively surprised I was hearing Myrath’s Tales of the Sands for the first time. Sure, hearing a band from Tunisia was a novelty, but it wasn’t where Myrath hailed from which won me over. Authentic, progressive and utterly memorable were the best qualities of Tales of the Sands. Five years later Myrath are now back, and I purposefully cut through the stack of promos to hear whether the earlier album was a single outburst. Relieved of hesitations, I need to report a complete and undeniable success with their latest output. Picking the band’s moniker for the next album’s title (Myrath means Legacy in Arabic), Tunisians are now making a confident statement, like many of their colleagues do when they come out with a self-titled album, that they have arrived and the sound you hear now is representative of their art. Still illustrative of their origins, but now with shorter rocking songs, Legacy is focused on immediate and tremendous accessibility. The album maintains the progressive edge, but today it is more about orchestral arrangements and string ensembles, which incidentally sound like a thousand sitars, instead of multilayered guitars and convoluted melodies. Legacy’s appeal comes from a crew very poised about their growth, the album showing no soft underbelly, delivering from start to finish, no weak composition to be found here. It is if Myrath no longer needs to convince us in their legitimacy, they can now enter the big-time studio, put in a lot of work and fully enjoy their own creations, blending non-contrived middle-Eastern melodies, tight riffs, sky-high hooks and symphonic production (Believer, The Unburnt, Duat). Intro Jasmin declares this “big sound” direction, and the band never really deviates or relents. Some songs have a bit of edginess and darkness in them (Get Your Freedom Back, The Needle), and slamming riffs on The Needle can pass for Evergrey, but unlike the Swedes the chorus in The Needle, just like the tenderness in Through Your Eyes, is uplifting and Myrath sound actually has hope in it. Even when the songs are tragedy infused like I Want to Die, as well as the most ethnic sounding Nobody’s Lives, there is light at the end of the tunnel on Legacy and it is an unusual, yet positive, attribute I personally felt throughout. Myrath vocalist Zaher Zorgati may not quite be middle-Eastern Dio, as I have heard him being called, but he certainly would give Kamelot vocalists, past and present, a good run for their money. He can certainly deliver with pain in his voice, when required, in Arabic verse on Nobody’s Lives especially, and he is also dreamy in places on Get Your Freedom Back, flows alongside a fantastic melody on Endure the Silence, or is almost playful on the Arabic pop tune made heavy on Other Side. If I made it sound that guitars on Legacy are diminished, please do not misconstrue. It is just arrangements often overwhelm and take over, sounding like Phantom of the Opera on Storm of Lies, yet it is harsher Saberdance-like solo which reminds us that we are dealing with a storm after all. I am not always subscribing to the theory that one has to produce odd time signatures and finger twisting leads to be called progressive. 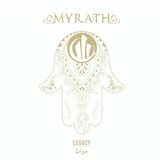 On Legacy Myrath uphold the genre with clean uncluttered lines, obvious power, conviction and overall forward outlook. I know the year is just beginning, but Legacy is going to compete for my album of the year on the power progressive/symphonic end of spectrum, and is very likely to win.